There are three beers that I feel form the trilogy of fermented flavour awesomeness. The first is my personal favourite Rochefort 10. The second is by buddy's favourite, Orval. Final spot of honour falls upon my wife's favourite, Rodenbach. If I were stranded on a deserted island... you get the idea. Rodenbach is the pinnacle of sour beer perfection. The brewing process is quite complex and involves multiyear aging in open air oak vessels called foeders. This brewing process, and subsequent blending, produces a sour ale of startling complexity. One can pick out flavours of sour cherries, caramel, oak, balsamic vinegar and red wine. Whenever I taste a beer that claims to be a Flemish red sour, the comparison relative to Rodenbach is determined. It can be very hard to duplicate the fruity esters of cherries without a long and complex wood aging process. One way to mimic these flavours is to add in cherries. I fully endorse this idea. The best year so far. A nose that carries a tart, sweetness of cherries is sure to please Rodenbach fans. Within all that are hints of oak, balsamic and apple cores. It is not often you experience an effervescent, cherry infused balsamic but this is one of those times. Add to that a sweet prickly acidity that lingers and you pretty much sum up the Sang 2016. A must for sour fans. Food Pairings: I would recommend a sweet and sour Chinese dish. The bright acidity and effervescence would cut the heavy fats. While the sweet and sour from both would just resonate. Porters never get a high score with my rating system. They are just not powerhouse beers. Rarely do you get a porter that adds a complexity of depth that keeps adding new flavours with each sip. Baltic porters maybe, but not English or American. These latter beers are simple in flavour: little roast, little chocolate with a hint of coffee or toffee. Usually not a lot of hop nor yeast character. This is not to say that porters are not enjoyable, quite the opposite. Each sip will distract you then release you back to reality. 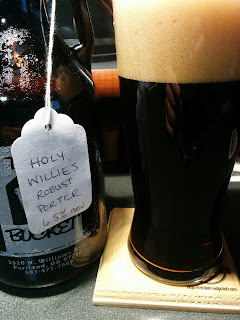 The robust porter was the stronger version of the brown porter in the 2008 BJCP guidelines. In the current guidelines, brown became English and robust became American. I am also glad to see that this version in not adulterated with added flavours. No blackberry, maple syrup or mocha porters for this beer geek. So how does it taste? Yup, it tastes like a proper porter. Roasted grains, cereal and earthy hot chocolate powder gently rise from the glass. Luckily the sip is not overly acrid with roasted astringency, just nicely medium. The flavour parts align like a middle school math question: common denominator or roasted bread crusts, weak coffee, hot chocolate powder and a hint of dirt. Not too quick a fade, yup solid porter. Should have brought the bigger growler. I think this is a truly new release from one of Victoria's oldest breweries since 2014. For those keeping score, the last release was Sabotage. Nice to taste something truly new. Not much about this beer on their website, so how does it taste? Yup, it's got Mosiac. It has the nose of tangerines, mangoes, papaya with only a hint of grass. I thought it was a little thin with a medium full and astringent mouthfeel. The tropical never stops, you might get a little bready and caramelized malts if you are lucky. But the rest is all assertive astringency of the tropical fruit, tang, papaya and onion variety. This flavour lingers for an impressive length of time. Nothing off or grassy to note, quite tasty. You are either a Mosiac (HBC342) fan or not. Glassware: Just a clean pint glass or a fancy IPA glass. I think the IPA glass is a little over-rated and hard to clean. For some unknown reason, I decided to visit VIB today. I heard an empty growler in the trunk and had 30 minutes before violin practice pickup, so growler run it is. The closest place was VIB, Phillips or Moon. Being a beer ticker, I had to try something new. VIB had the red pilsner on tap, which I thought was a new beer. More on that later; don't worry, there is a happy ending. The label on the tap said "Storm Watcher Red Pilsner", didn't VIB already have a beer called Storm Watcher? And what really is a Red Pilsner? Neither BJCP nor Brewers Association has a red pilsner in the guidelines. Perhaps it is a Vienna lager, International Amber lager or an Altbier. This red pils might fit into these categories. Or perhaps, this is just a winter lager? Dang it, is this another VIB recycled beer recipe? Sure tastes like it. I actually plan to cut and paste an old review, because the flavour is similar. Luckily they had 2016 Hermannator and a new IPA called Highway 19. 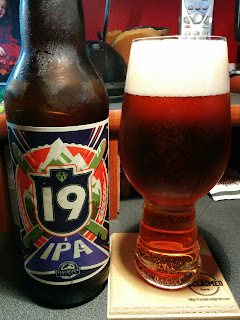 The Highway 19 is your standard IPA dry hopped with Mosiac, at least that is what the nice lady behind the counter told me. She seems very confident and believable. I got a sample also; SPOILER ALERT, it's good. This ruby red brew is nice to look at, even though there is no foamy head. Despite the lack of head, it still offers up hints of vanilla and caramel with slight spicy hop presence. A cool creaminess delivers lots of malts - think graham crackers, caramel and raisins. There is also a continuous presence of vanilla that is not overpowering. The ending is sweet, quenching and ever so slightly astringent. The storm watcher will appeal to beer drinkers who like their brews on the sweet side. Food Pairings: This would pair perfectly with an unsmoked ham and cheese sandwich on rye. Perhaps a caramelized onion and mushroom cream sauce over buckwheat noodles. Maybe a desert of sticky toffee pudding would accentuate this lagers sweetness. Come to think of it, the Storm Watcher could be used to make a hot toddy. So apparently I have a reputation. It involves having a couple of beers and criticizing blogs and beers. Not sure if this is true - then again - if it were true, I would probably deny it. Let's pretend it is true and let loose. Sorry Adem, no beers on board, just a coffee and mango slices. This is the favourite time of year for a beer geek or aficionado. When I was young, the Sears Christmas toy catalogue was the greatest publication in the world. This has now been replaced by the GCBF beer list. The 2016 list has some great options and a few new breweries. A perfect list for me would be filled with casks and new limited releases. However, if any brewery that focused their marketing department on the above average beer geek, would go out of business quickly. I'm assuming limited beer releases do not pay the bills. I feel a brewery should bring lesser known core brands, something new and maybe a creative cask. That way there is something for everyone. 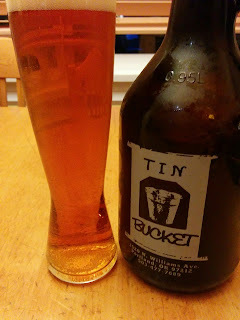 There is an average assessment of this years beers list on The Brewtal Truth blog. Actually it is quite an accurate assessment. The cheeky description was to taunt this very accomplished author. However, he did miss a few things. I plan to skip 33 Acres of regularity, which saddens me. They only brought a dry hopped regular release with unknown hops. I usually look forward to trying their creative brews. Beau's is bringing a gruit or herbed beer. This should be interesting. Be Right Back are one of the new kids this year at GCBF. They are also bringing a lesser known beer style called the Kentucky Common. 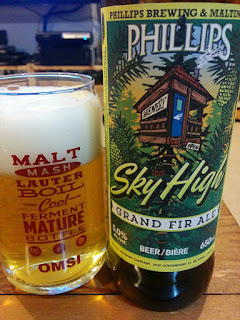 This beer style is one of the lost styles that was recently added to the BJCP list of beer styles in 2015. Looking forward to tying their interpretation. Brasserie Dunham, yes all those please. Returning this year is Crannog and they are bringing a whisky infused Back Hand of God. I sure hope there is some left when I arrive late. Will the whiskey also be organic? Deep Cove has the best beer name at the festival. I'm surprised it took this long to name a beer after the pub crawl anthem by Spirit of The West. Foamers Folly have a nitro IPA, which is hard to find. Also their beer naming department needs to use Google. Doesn't Red Arrow in Duncan have a beer named Idle Hands? Granville Island is rarely a booth I stop at. However, this year they plan to serve a proper Berliner style weisse with choices of sweetening syrups. I had a stellar Berliner from Troubled Monk that was packaged with raspberry and woodruff syrups. Attention Highway 97, the a traditional Scottish ale does not contain peated malts. Four Winds. I has hoping for super awesome things from one of my favourite breweries. Truth be told, I flipped to this listing first. Their beers are all delicious, but I was longing for something new. Lighthouse is bringing a perfect mix of lesser known core brands, new releases and casks. Three Ranges always brings solid beers to the festival and I plan to try their cask, despite my disdain for cilantro. Don't forget about the newest Victoria brewery Twa Dogs. I'm not one for cider, mostly due to lack of appreciation and familiarity. However, I plan to offer up a token for their cask of Spanish style sidre from Tod Creek. This style is tart, acidic and sometimes lightly sour. I also have a booth category similar to Brewtal Truth. Their award is called "Why Bother". I call mine the "Zzzz" award, mainly because their booths don't add much excitement to this great nation's most important festival of brewing. Beer geeks, beer writers, sales reps, importers/exporters and people with deep beer money pockets come to this festival to sample the best and varied offerings from Canadian brewers. One would naturally assume breweries would want to bring their best. Bomber, Bridge, Canoe, Gladstone (I expected more), Persephone (only core brands), S&O (core only). Vancouver Island. Serving Islander (aka craft Lucky) at GCBF. Although, the root beer cask does sound interesting. Hoyne core brands only and mentions a cask without how it is different or enhanced. Phillips. Blue Buck and Pilsner? Blue Buck cask with Citra? I might be an very amateur homebrewer but isn't Sorachi Ace a mild flavouring/aroma hop, how are those dill and lemon flavours going to be noticed from beneath a chocolate and roasted porter? Still... might offer up a token is I have tried everything else. 15 minutes, Go. In case you were under a rock somewhere, or using Google+ instead of Facebook, you might not have heard that Twa Dogs brewing is now operational. You might also know them as Victoria Caledonian Brewing and Distilling. I am more concerned about the beer, but rumour has it that the first running of the whiskey is quite tasty. Located in an unassuming warehouse off the Pat Bay, the interior is far more appealing than the exterior. Back to the beer, at this moment they have two beers on tap, a saison and a pale ale. The pale is - well pale - but solid and much better than average. I am currently drink the pale now in a rapidly emptying glass, must have a hole in it. The beer score is 6. Why 6? Because I only have 15 minutes, but trust me it is worthy of a glass fill. 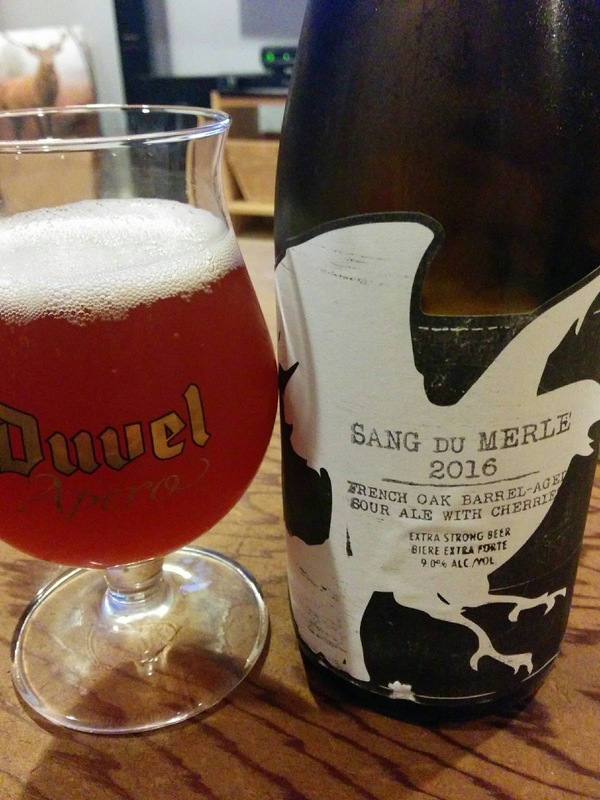 Saisons are always benchmarked against the exceptional Saison DuPont. Which is both good and bad. Bad is that few beers ever make the grade, but good in that we always drink a Dupont to refresh our palates. I never understand how this excellent beer is under $8. Dean did give me a quote about the beers, but I forgot to write it down. Something about beers are evolving with improvements and recipe refinements being made and if you drink more we will brew more. I should bring a pen and paper to interviews. In this beer reviewers uneducated assessment, this is a very, very solid first run. DISCLAIMER: The head brewer, Dean McLeod, is a friend of mine according to my criteria. However, this never taints my reviews. The first sniff speaks of peppery yeasts and warm cereal. A hazy sip adds the chewy mouthfeel which oddly lacks effervescence. 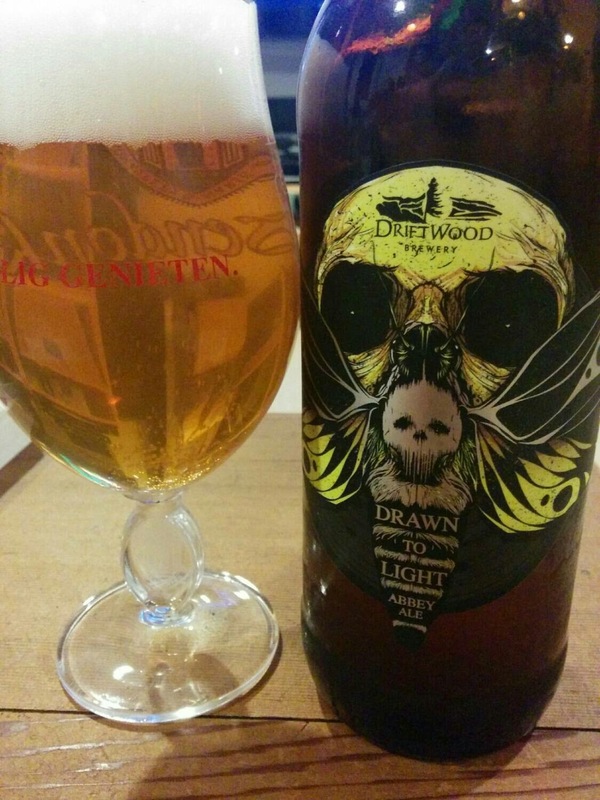 This highly quaffable mix of spicy hops, lemon pith with muesli glides over the tongue with ease. It's off dry linger fades away cleanly. Is it a Dupont, no. Will you be delighted to see this beer on a draught list, yes. I know I will be. OK 15 minute beer review, GO! New format. The speed review, so many reviews to catch up on and Victoria brewers have been pumping out the releases. So the Belgian golden strong is the hard to master category that is owned by Delerium Tremens and Duvel. It should be strong but not show it. Sweet, but hinting to the dry. Crisp finish to reveal minimal hopping. We all look at the category and compare beers to that pink elephant. Which is unfair, there should be room for interpretation. Rather like a Schopenhauer essay, your perception is your reality. Still if you are going to label it, you gotta own up. Does the C12 make the grade? You tell me. I'm out of time. A tad syrupy for a BGSA, but tasty fruitiness makes you overlook that. I noticed apricots, pears, cotton candy and a slight wood presence. This beer was a tad hot, but nothing unreasonable. Did not taste a hop presence, but that's OK. There was a hint of wood character, think wood pencil dipped in vanilla extract. Over all, worth your hard earned money. Appearance +1 great description of flavour. Glassware: Certainly a tulip that Kendrew envies. Cellar: Maybe. Didn't see a lot of residual yeast. Seems to be a Driftwood trend, renaming old beers. Apparently this used to be the Spring Rite. Perhaps the same is true for the "Cry me a River" Gose and "Gose-uh"? Either way, still good beer. If it makes you feel any better, Vancouver Island Brewery hasn't released a new beer in almost two years. Aromas from the moth beer, remind me of a calm Raised by Wolves, slightly spicy, quite tropical of pineapple, oranges with a hint of pepper. Nothing really dominates. The graininess, honey, earthy lemons and peppery yeast all play nicely together. 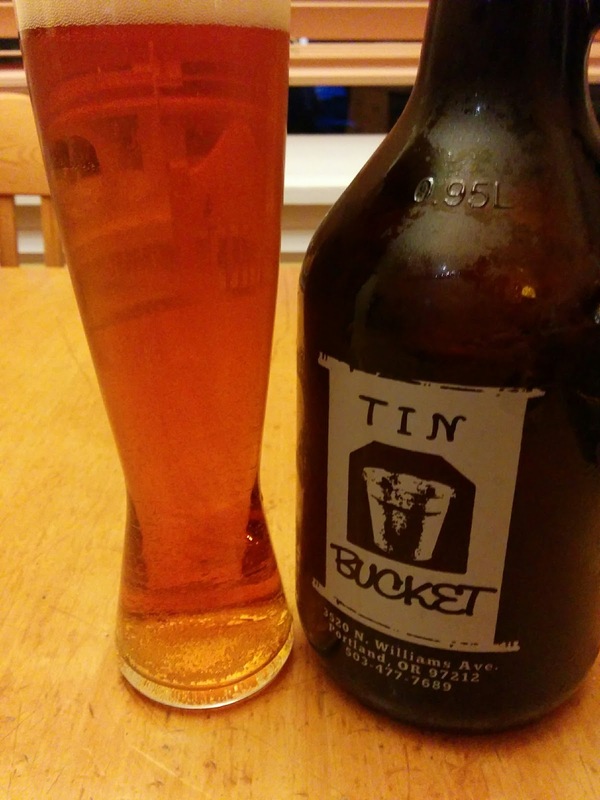 A light to medium mouthfeel finishes dry with a buckwheat honey linger. Quite tasty and worth a try, if there is any left. Food Pairings: The tang of a goat cheese and arugula, would bring out the spiciness in the beer. While the residual sweetness would balance the bitterness of the arugula. No preamble nor sharing, just cleaning up notes. This was the second in the Phillips sour series, Thorny Horn was the first. And much tastier. Not a big fan of this one, most of the sour or tartness came from grape additions. It smelled a little like table grape bits on dark toast. 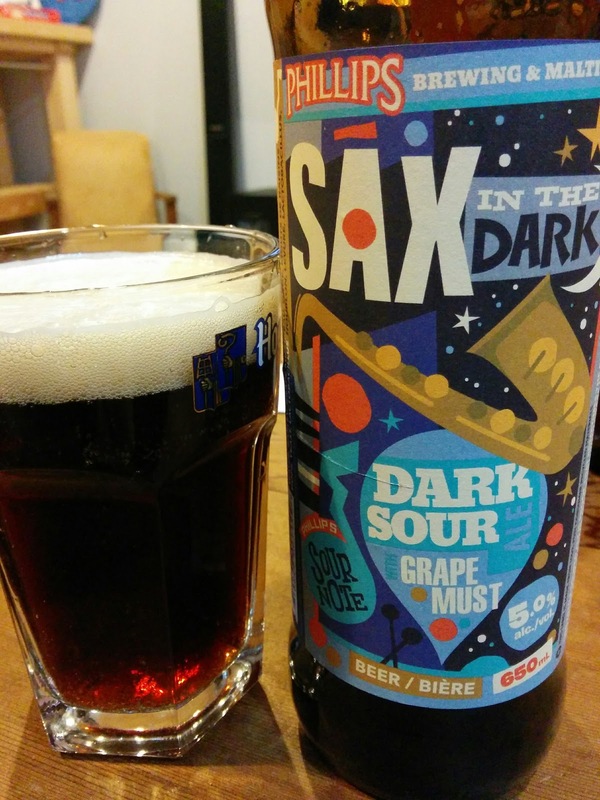 Sour notes seemed to come from grape tannins and not Lactobacillus influence. The sip was a mix of whole wheat toast, slight chocolate and tart grape seeds with a linger of tongue coating grape tannics. Not really for me. Has it been this long since a blog post? I truly am slacking. The Phillips Botanicale should be thought of as either a gruit or that dreaded BCJP category called "experimental" or "spiced". Although I don't think it is truly a gruit as this beer has hops for bittering while a true gruit only uses herbs or spices. The asterix means you must like gin. 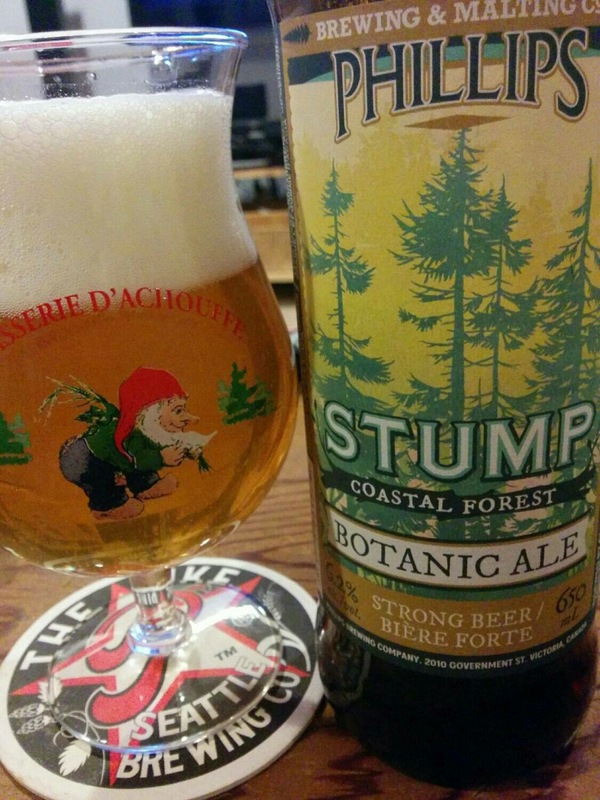 The flavour is very reminiscent of the Phillips STUMP gin, which does contain Cascade hops and Grand Fir. There are much things gin on the nose: juniper, orange oil and forest. Reminds me of a well done negroni. These botanicals add a creaminess to the light to medium mouthfeel. It drinks like a plain pale ale with a shot of gin. Much botanicals with orange oil, juniper sweetness tempered with a citrus bitterness. The finish is a long coating of orange oil. Definitely worth a sip, if you like gin. Food Pairings: Crab cakes, must be crab cakes or any other firm fish. Perhaps with a sage, rosemary and basil rub to get your herbal mojo going. This is terrible, two months of no beer reviews! Maybe I will just go back through my notes and not really post anything online. Thinking ahead for the 2106 top beers of Victoria. Food Pairings: Poached lamb with tangerine glaze. Cellar: maybe. Citra character will fade for sure, but will Brett take up slack? There can never be enough nitrogenated beers. Nitrogen gas adds a creamy mouthfeel and sweet flavour. Since nitrogen is quite insoluble in most liquids, it adds a thicker creamier mouthfeel. When served on draught, nitro beers display that classic bubble cascade associated with a certain Irish stout. Within that fancy nitro beer faucet is a restriction plate (plate with tiny holes). Beer is forced through these narrow openings and nitrogen is forced out of solution, which leads to that large dense head. Nitrogen gas also has a sweetness which contrasts and softens bitter beers like stouts and porters. I have heard of nitro IPAs and hoppy pilsners. 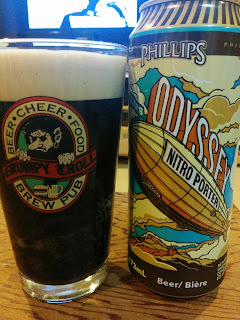 If Clay is reading this, which I doubt, perhaps he would consider a nitro version of Potts Pils? That would be nice. 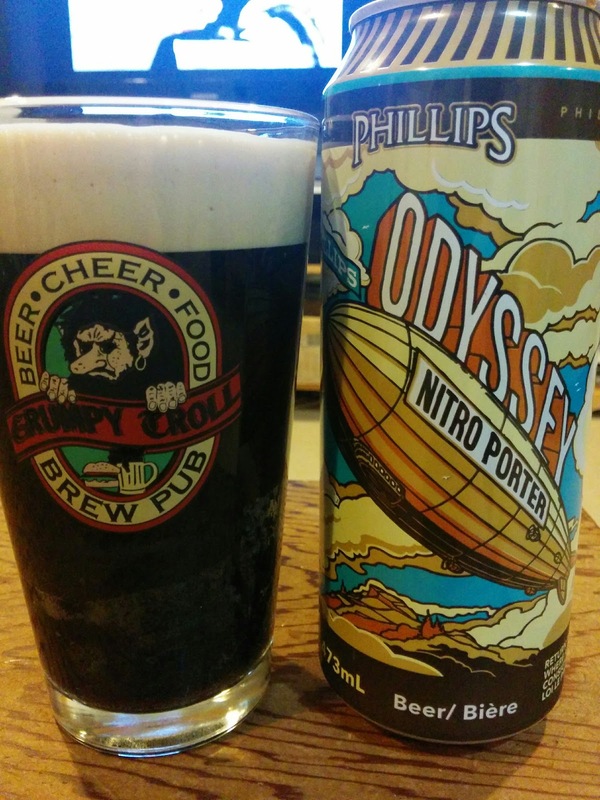 When nitro beers are available in cans, there is a whole different magic that happens. Read all about it here, because the internet is always true. Regardless, with a quick opening and a hard pour you can enjoy a creamy cascading beer at home. A sweet aroma greets you with an equal mix of light toast, powdered milk and cocoa. The mouthfeel is creamy as expected, but a little thin. This is a straight forward porter with dry cocoa, milk chocolate, toast and slight fruity red apple. It all ends with a whipped cream and chocolate finish. Overall it is very nice. Food Pairings: I would go for a mushroom and beef stew. The chewiness of the stem would mesh well with the creamy mouthfeel of the Odyssey. Generally stews are rich and umami heavy, perfect to balance with a sweet porter. For any veggies reading this, try with a mushroom and red kidney bean pot pie. Rye is the new and trendy grain to brew with these days. It ranks up there with the kettle sour. There is nothing wrong with this trend at all. When in used appropriately, rye adds a pleasant dry cereal and characteristic spiciness to a brew. Rye is apparent in the nose with its desired spicy cereal aroma. Not use why I am picking up marshmallow, maybe it is the kidlets hot chocolate. 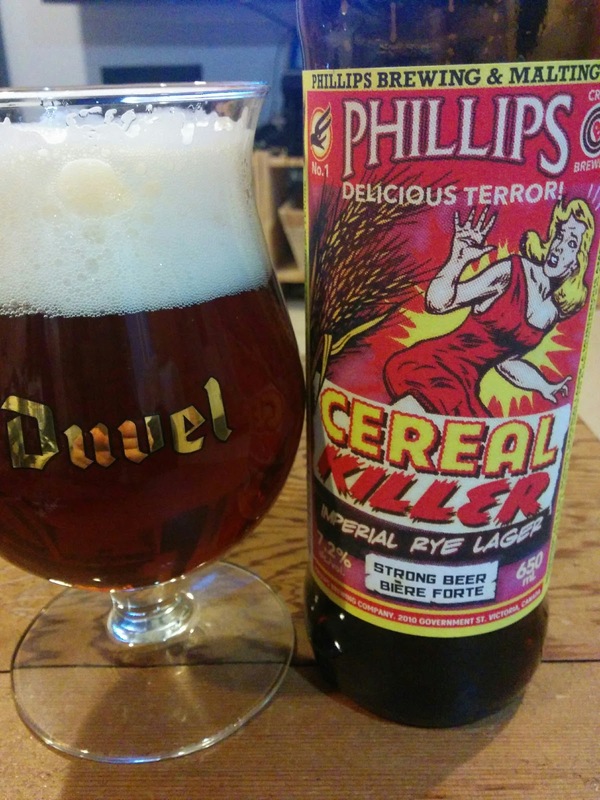 Despite the slightly slick mouthfeel, the Cereal Killer delivers the rye. 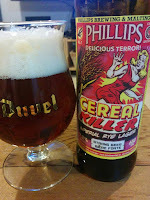 It has the wet cereal, light spicy rye and chewy red apples you might expect. The only flavour not to fade was the sticky cereal. Tasty for a bottle, but might not buy a second one. Food Pairings: Indian food or Thai would do nice. The spiciness would blend together while there is enough maltiness to calm the spicy heat. Hello tofu Pad Thai. Even the carnivores don't mind this dish. I love sour beers. The love of sour beers is polarizing in my opinion, you either love or hate. There is no middle ground. I feel this is the same for many culinary delights. Other examples include asparagus, sushi and cilantro. Let it be known; I do not like cilantro. Back to sour beers; I love sour beers. Luckily they do not contain cilantro. Many fresh agricultural products are paired with bacteria or yeasts that will help ferment them. Grapes are covered in wine producing yeasts, ditto for apples. Barley is covered in Lactobacillus, which if whetted will lead to lactic acid fermentation. Normally wort is boiled to kill off these bacteria so the Saccharomyces yeast can ferment without competition. One exception is kettle souring. This brewing technique gives lactic acid bacteria a head start to produce the desired levels of sourness and attenuation. Once the desired level of sourness is achieved, the wort is boiled to halt the souring process and traditional fermentation proceeds as normal. Or in the case of the Berliner Weisse, the souring process if allowed to run its full course. Think of this as a lambic without atmospheric influence. Brewers might pitch a Lactobacillus culture to speed things along or produce a desired flavour. Which leads us to the current trend of kettle souring. Many craft breweries are attempting one. Axe and Barrel makes a very nice spruce tip kettle sour. The nose is similar to lactic acid fermeneted beverages, think Kefir or yogurt. It also carries a hint of pine and oranges. A pleasant acidic tingle and oddly thick mouthfeel delivers all the sourness. Some felt it was a bit sweet, but I like a sweet beer. There was an equal part cereal, citrus and breadiness mixed together with an approachable yogurt like tartness. If you like your sours, this will make you happy. Sadly due to my lazy attitude this beer is already sold out. However, the Moon's Facebook page mentions another kettle sour release. Glassware: Something small. I big glass of this sour might be hard to go through. Food Pairings: This might be interesting contrast with a sweet dish, perhaps corn chowder. A good pairing would be an arugula salad with tart, salty feta or lightly acidic young goat cheese. Cellar: I might try cellaring a growler of sour one day. Is this the first release of the year? I think so, which is often the way with Phillips. Always with the fast and furious releases. Again with the firsts, this might be the first fir tree beer in Victoria. 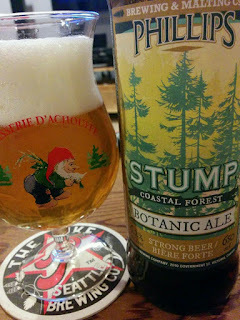 We have had several spruce tip releases, most notably from Tofino and Axe and Barrel. The nose is as you would expect, forest. What was unexpected was the prominent orange crush aroma. It reminded me of a trip to Silk Road Tea House to randomly sniff the essential oil selection. Although, I sometimes feel that most evergreen trees have a slight orange smell. The aromatic fir oil added an extra spiciness to the medium-light mouthfeel. It tastes just like it smells with an added straw, white bread malt background. Tasty enough, but I don't think I will have another. Food Pairing: I wouldn't try to pair this beer with anything specific, too many odd, prominent flavours. If pressed, perhaps a cedar plank salmon with an orange or lemon glaze. Get your full forest on. Will judging homebew lagers will give me throat cancer? I admit that title was a tad shocking but I need to attract readership. It works for the newspapers, so I figured it would work for me. This title seems scary at first, "Short-term salivary acetaldehyde increase due to direct exposure to alcoholic beverages as an additional cancer risk factor beyond ethanol metabolism." One of the major off favours in beer is acetaldehyde, so we know it is present in some of the beers we drink. We also know that there tends to be more acetaldehyde present in lagers. Anyone who has judged a lager category has gotten a mouthful of green apple. Acetaldehyde is a known risk factor for cancer. This compound in beer as associated with DNA damage and impaired DNA repair. So will drinking beer put you at risk of cancer? The answer is yes, but it is not as bad as you think. In this study, students were given various alcoholic beverages to sample. These were sampled via the wine tasting method, swish, hold and spit. The beverages ranged from beer, vodka, wine to grape marc spirit. Oddly beer contained the lowest amount of acetaldehyde of all beverages except for vodka. I'm not sure what grape marc spirit is but I plan to avoid that crap, it contained the most acetaldehyde by far. Acetaldehyde is formed in the body by liver metabolism and mouth or colonic bacteria. This was news to me. It also explains why poor dental hygiene is associated with higher risks of certain forms of stomach cancer. Back to our beverage spitting, cancer developing subjects. After the swish and spit, levels of acetaldehyde were measured in the saliva over the next 10 minutes. This method would allow bacteria present in the mouth produce acetaldehyde. Acetaldehyde levels rose and faded over 10 minutes of saliva sampling. As predicted, initial acetaldehyde levels in beverages we responsible for the first 30 seconds of exposure. After that, it was due to the bacterial modification of alcohol content. This was evident when comparing grape marc spirit and vodka. Levels of acetaldehyde of vodka are unmeasureable where as levels in grape marc were 15851 uM. For comparison beer only contained 210 uM. The makes sense, in beer acetaldehyde is considered to be a flaw and avoided. After ten minutes acetaldehyde saliva levels of those who sampled beer were undetectable while vodka and grape merc levels of acetaldehyde were similar. So what does this mean for beer drinkers? Beer drinking is a risk factor for cancer, but not as much as spirits due to beer's lower alcohol content. Even in bad lagers where green apple is noticeable, their acetaldehyde levels would be lower than grape merc spirit or cider. A large thank you to all my readers this year. Especially those pointing out dirty glassware and spellling errors. Another great year for beer drinkers in Victoria. There were almost monthly new releases, or almost new, from Phillips. Category 12 seemed to put out a new beer quarterly, all of them good. Again this year I was not able to review all the new releases from Victoria brewers. There were a couple of reasons for this. The first is that Spinnakers didn't always publish when they had new beers. Also some were draught only; I'm not going to take detailed notes over dinner. 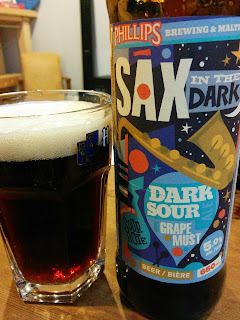 Secondly, some of Moon Under Water's sours I did not drink, but put directly in the cellar. And lastly I sampled very few from the Four Mile; this was on purpose. Now on the the list. 1. Raised by Wolves from Driftwood. This was no surprise to most people. I wish I had purchased more bottles to see how it evolved. Hopefully we will see this one again. 3. Obscuritas by Driftwood. A great beer in a great bottle. 5. Insubordinate Session IPA by Category 12. A sessionable IPA and didn't taste sessional. 6. Jackline Rhubarb Grisette by Lighthouse. This was the only beer in 2015 to score a 5 in taste, and well deserved. 7. Master Blaster by Swan's. This first brett beer from Swan's was a tropical fruit funky delight. 8. 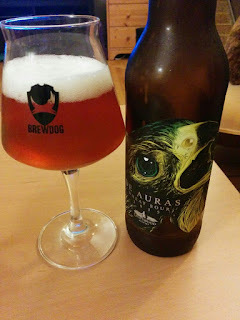 De Auras Wheat Sour by Driftwood. Need I say more? 9. Waveform Wit by Category 12. It hit all the wit flavour check boxes with a new twist. 10. Legacy Ale by Swan's. It is nice to have a barley wine that is a pleasure to drink upon release. Sadly this leads to not great aging. Honourable mentions in no particular order. Discover Coffee Lager by Lighthouse. This did not get a formal review due to it's keg only release. The coffee flavour was subtle and had no harshness. The sour line up at Spinnakers. Individually they would not hit the top ten list. But as a group, it was an impressive lineup for the small brew pub. The sours at Moon Under Water. These were included because they are in the cellar, but the one's I sampled at bottle shares were stellar. I also felt bad that Moon wasn't mentioned despite all their great beers this year. 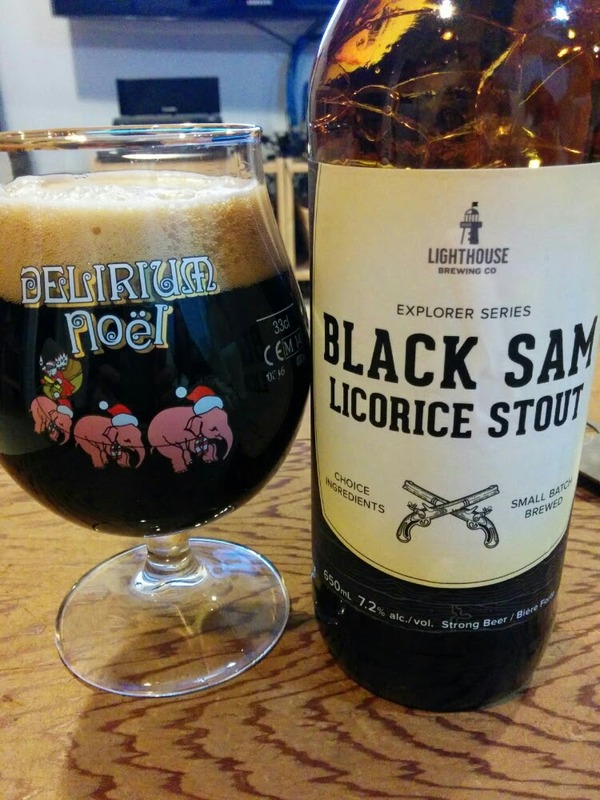 Black Sam Licorice from Lighthouse. The best packaging of the year goes to Obscuritas by Hired Guns. With the runner up Scarfface by Phillips. I resolve to visit the Four Mile this year. Never went last year. Still never went on that brewery tour. 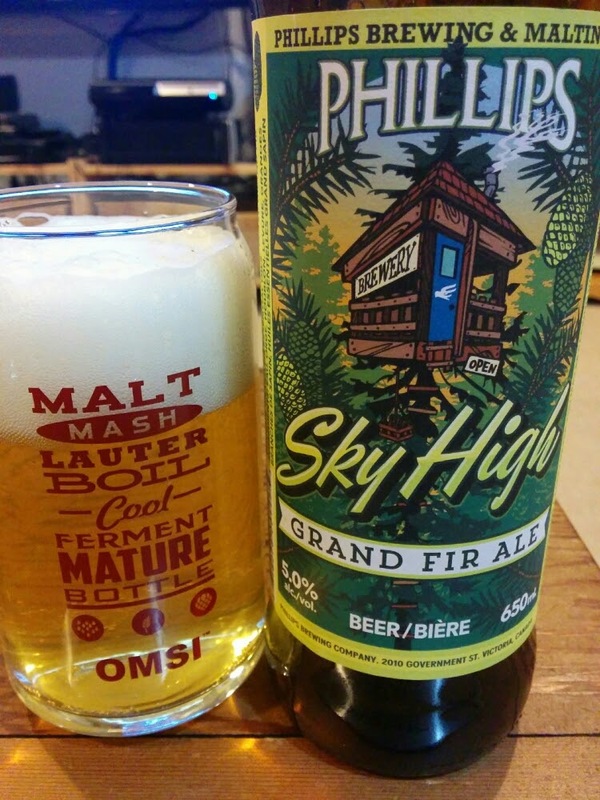 This year will be even harder to try every new release, as a brewery, or two, is opening in Sooke in 2016. And there might be two more production breweries in Victoria this year. This is what I call a pseudo-sour. When I hear the word sour, I imagine tartness from Brettanomyces, Lactobacillus or Pediococcus . 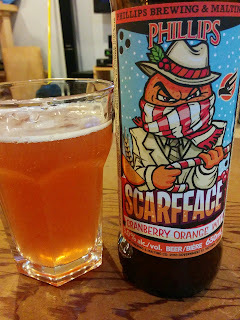 The sourness and tartness from this beer is fruit derived, which is just fine. The nose has a bit of funk to it, but all I got was raspberry jam and bike tire air. It is all about the jammy fruit tartness on par with cranberry cocktail juice. You do get a bit of chocolate and acidity enhancements. The sourness is fruit derived only. Food Pairings: I'm thinking dessert. The fruit sourness would balance a sweet cheese cake. I raspberry or other berry topping would bridge the two nicely. Cellar: This one might develop more sourness as time passes. If you can still find one, it would be a reasonable addition. The nose is oddly sweet of oak barrel, horse blanket and Gewürztraminer. As expected it is tart, medium acidic with a hint of dry tannins. Each sip reminds me of a white wine. Except this wine has been steeped in horseblankets, light pit fruits, oak and a sweet acidity. Yum. Think of this as an imperial Berliner Weisse. Glassware: Something tulip in shape. Food Pairings: Pair with sours is hard but not impossible. I'm thinking of an arugula salad with young goat cheese and a tart vinaigrette. This could also blend in nicely with a sweet and sour Chinese dish. Cellar: Aging this one is a crap shoot. The malt base is not very complex, but could be fun to see what the yeast does over time. This beer is certainly a front runner for best label and wittiest name of the year. Although it might not be the most original; anyone remember the blood orange wit? Still, it's a tasty little glassful. Orange is the most vaporous aroma, perhaps Orange Crush or Orangina. Naturally there is a wheat creaminess too. The taste is pretty straight forward; creamy wheat, sweet oranges and a light lingering of tart oranges. Not sure where the cranberries went? Glassware: Put it in a clean pint glass to keep Chapman happy. If you have an octagon wit glass you could use that, but that is a bit obsessive. Food Pairings: Peking Duck or duck à l'orange. The tart orange flavours would bridge nicely with the duck and the effervescence would help lift the fat from the palate. Bird lovers can substitute braised bean curd.